NEC is currently the only Vendor that is shipping an OpenFlow enabled product today. So naturally, their presentation led off with a message about what they’re bringing to the market. If you don’t know anything about OpenFlow, please read my previous post covering the OpenFlow Symposium. 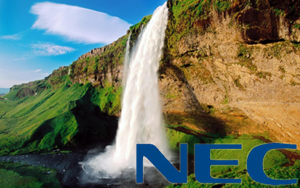 Currently, NEC is shipping their OpenFlow implementation as ProgrammableFlow products which include a ProgrammableFlow Controller (PFC), and a ProgrammableFlow enabled switches. Unfortunately, I’m unable to find any documentation on these products as NEC’s actual website was written by someone who enjoys a difficult maze… (the only page I could find on ProgrammableFlow was here) But I digress. The PFC it’s self is just a Linux box with some custom software implementing the OpenFlow 1.0 standard. In addition to acting as part of your control plane, it can also do topology discovery via LLDP, and perform fault detection and possibly even repair. The graphical representation NEC gives you of your network with their controller software is rather nice, it’s not just a visualization of your netowrk, but it also provides end to end monitoring of each individual flow transported over the network. As for NEC’s ProgrammableFlow switch, it is a 48-port GigE switch with 4x 10Gb SFP+ uplink ports providing line rate multi-layer switching, and maintaining up to 160k OpenFlow “flows”. The switch itself can operate as a hybrid either allow you to control it via an OpenFlow controller, or operate as a traditional managed switch. NEC has also developed a vSwitch for Windows 8’s Hyper-V, this alone should prove to be rather interesting as NEC will hit the ground running on virtual switching with the new release of Windows Server 8. NEC was a sponsoring vendor for Network Field Day 2 and as such they my travel expenses were indirectly paid in part by them. They also gave me swag… However, I was not paid to write about them, nor was I asked to give them special consideration. Any opinion expressed by me is mine and mine alone.